The thigh is the area between the pelvis and the knee. We divide the thigh into three compartments: anterior, medial, and posterior. Sartorius: It is the longest muscle in the body. It assists in flexing, weak abduction and lateral rotation of the hip, and knee flexion. Rectus femoris: It is the only muscle of the group which crosses the hip joint and is a powerful knee extensor when the hip is extended but is weak when the hip is flexed. Vastus lateralis or externus: It´s the largest part of the quadriceps femoris. – Immobilizing the knee ie. casting, inflexible knee brace. 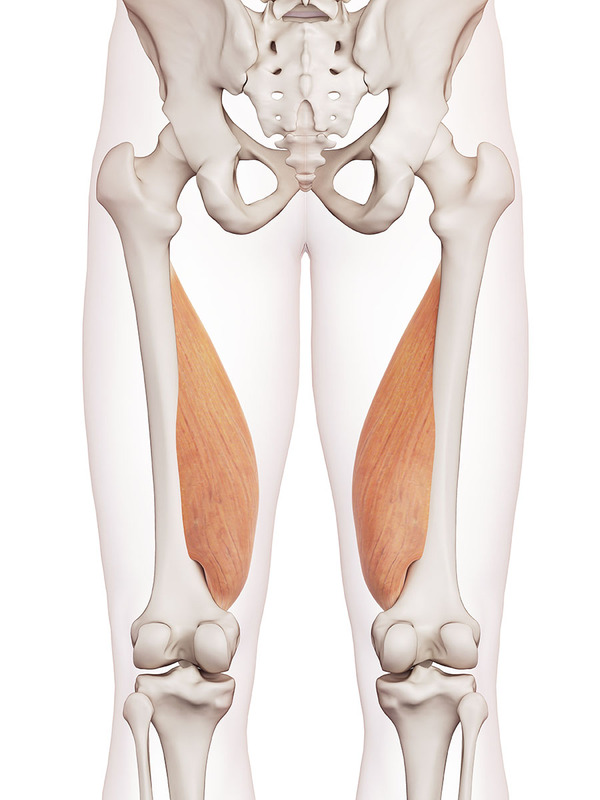 Vastus medialis: It is the deeper muscle of the quadriceps muscle group. The intern is the most difficult to stretch once maximum knee flexion is attained. It can´t be further stretched by hip extension as the rectus femoris can, nor is it accessible to manipulate with massage therapy to stretch. Vastus intermedius: It contributes to correct tracking of the patella. Gracilis: Is the most superficial muscle of the medial side. It adducts, medially rotates and flexes the hip, and aids in flexion of the knee. Pectineus: It is the most anterior adductor of the hip. Its primary function is hip flexion. Also, it adducts and medially rotates the thigh. The pectineus is often injured when a person starts a regimen of power walking. During power walking, a person will often extend their stride, reaching farther than they would in a normal stride. Overextension, while walking or running, can stain the pectineus. Adductor brevis: immediately deep to the pectineus and adductor longus, the adductor brevis pulls the thigh medially. Also stabilizes the movements of the trunk when standing on both feet,m or to balance when standing on a moving surface. Primarily known as a hip adductor, it also functions as a hip flexor. Adductor longus: Adducts the thigh and medially rotate. Adductor magnus: Powerful adductor of the thigh made especially active when the legs are moved from a widespread position to one in which the legs parallel each other. Trigger points in the adductor magnus can cause pain deep in the pelvic area. Pain may present as a dull ache or a sharp stabbing pain. Those suffering from adductor magnus symptoms often sleep with a pillow in between the knees to ease pain. Biceps femoris: It has two parts or “heads”. Both heads perform knee flexión. The long head (1 of the three hamstring muscles) is involved in hip extension. It is a weaker flexor when the hip is extended as well as a weaker hip extender when the knee is flexed. When the knee is semiflexed, the biceps femoris rotates the leg slightly outward. Semimembranosus: It helps to extend the hip joint and flex the knee. Also medially rotates the femur when the hip is extended. It can counteract the forward bending at the hip joint. Semitendinosus: It lies between the other two muscles. Collectively flex the knee and extend the hip.